The Crab Nebula, M1, is the first object that Charles Messier catalogued. 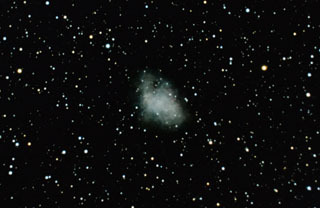 In 1054 A.D., a progenitor star exploded as a supernova - a star which completely obliterates itself. Because this star was located in our own galaxy, the supernova was extremely bright. Chinese astronomers noted that this "guest star" was so bright, it was visible during the daytime and cast a shadow at night! 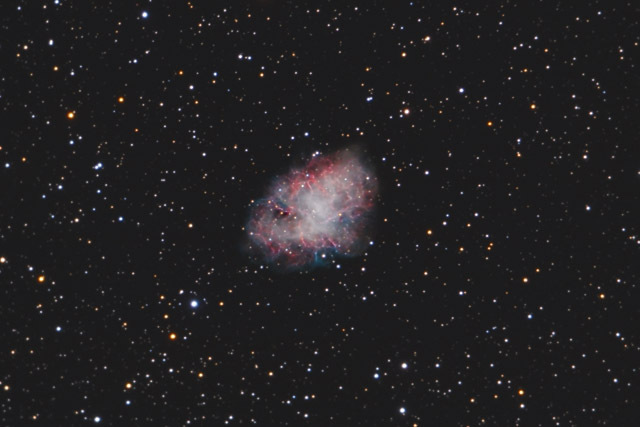 Today, the Crab Nebula is well below naked eye visibilty at magnitude +8.4 (in a dark sky, a person with good vision can see to about magnitude +6). It is located in the constellation Taurus, and is easily found by identifying the bright star, Zeta Tauri (the southern star at the end of Taurus' horns). M1 is a little over 1 degree to the northwest of Zeta Tauri. Software Used Images Plus 4.0 for camera control, calibration, and stacking. Images Plus 5.5 for digital development, adaptive Richardson-Lucy deconvolution, multiresolution sharpening, smoothing and noise reduction. Photoshop CS5 used for levels and curves, color correction, selective color, match color, high pass filter, star shrinking, lab color, saturation adjustments, screen mask invert, hdr toning, and smart sharpen. Gradient Xterminator for gradient removal. Straton for star removal. Carboni Tools for additional saturation adjustments, noise reduction, and smoothing. HLVG for additional color correction. Focus Magic for focus restoration. Notes This image is my first light image with my new Gary Honis modified Canon 450D. I'm extremely happy with the camera - the noise is extremely low, and the modifications make it quite sensitive to the light from faint astronomical objects. This image also represents a big improvment from my attempt last year.